The SF6830 is a tillage tool specifically designed to provide producers the high speed, high residue flow capabilities unattainable with traditional shank equipped finishers and cultivators. It produces a smooth level seedbed not always obtained by today’s vertical tillage tools. The SF6830 Series is a new concept in seedbed preparation. The tool is completely void of sweeps and combines four types of rolling ground engaging tools into a three step process: spherical disc blades & reels, wavy coulters, and the Sunflower exclusive “Rolling Spider Tines”. With this tool you can build a perfect seedbed in one pass. The SF6800 Series is also the first Sunflower tool to be equipped with Sunflower’s all new “maintenance-free” disc gang reel bearings. Sunflower has launched a new era in tillage with the SF6800 Series. The High Speed Story: Developed to operate in different types of soil conditions and crop residues, operating at speeds in excess of 10 mph the new SF6830 will size residue and produce an extremely smooth soil profile. The SF6800 combines four different types of ground engaging tools, each strategically located on the tool to accomplish a specific task. First, the 20” low concavity blades size the crop residue while moving soil latterly. The gang reels placed directly behind the blades to limit the lateral movement of the soil while breaking clods and crushing standing stubble or stocks. Following the blades and reels is a gang of wavy coulter blades. These blades are 2”wide and positioned to fracture the soil and size crop residue. Two intermeshed gangs of “Rolling Spider Tines” (patent pending) complete the seedbed building process. These unique tines are designed to insure the soil is leveled and the residue is equally mixed across the entire width of the tool. Since all the ground engaging tools utilized in the SF6830 are of the "rolling" type, the possibility of the unit plugging is practically eliminated. First Step Disc Blades & Reels: The first step is leveling and sizing of crop residue. This is accomplished by a gang of low concavity 19.69 inch (50.8 cm) diameter, 1/4 inch (0.635 cm) thick blades at 7 1/2 inch (19.1 cm) spacing. These blades are set at an 8° angle to provide just the right amount of lateral soil movement to level soil and anchor residue. The spring loaded, 11 inch diameter flat blade reel ensures the soil flow from the disc blades remains level. Spring Protected Disc Gangs Reels: The disc gang reels intercept the soil from the disc blades limiting the lateral movement of the soil. They prevent the soil ridging normally associated with single gang tillage tools. The reels turn at twice the speed of the disc blades and aggressively attack and break up clods and root crowns. The spring mounts on the disc gangs reels ensure sufficient down pressure to keep them engaged and protect the reels if they strike a rock or other similar object. Second Step Wavy Blades: The second tillage stage is comprised of a gang of eight wave coulter blades, 20” x 2” (50.38 2.05 cm) wide following the disc gang and reel. These blades, spaced at 7 1/2 “ ( 19.05 cm) split the centers of the disc gang. The wavy coulter blades shatter the soil and exert force to the left and right of the blade. They also fracture the soil below, providing avenues for root development. Third Step Rotary Spider Tines: The “finishing touch” is created by two gangs of Sunflower’s exclusive “Rolling Spider Tines” (RSTs). Spaced at 7 1/2” (19.05 cm) at the hub on a common gang shaft the tines are intermeshed one gang to the other. The RTSs are engineered with a twist at the ends of the tines which extends their reach 1.25” (3.175 cm) to the left and right overlapping the other tillage components leaving no soil unworked. Rotary Spider Tines: As the tines enter the soil., edge first, the flat of the tine immediately engages the soil. The tine edge sculpts the seedbed floor, lifts the soil, blending soil, crop residue and dry fertilizer (if applied). The benefits of this unique action of the RST attachment are numerous: Dislodged weeds deposited on the soil surface; Produces a smooth floor seedbed; Separates solid and fine soil particulates; Mixes soil, residue and dry fertilizer; Levels field surface. The extraordinary combination of rotary tillage components of the SF6830 creates an ideal seed environment. 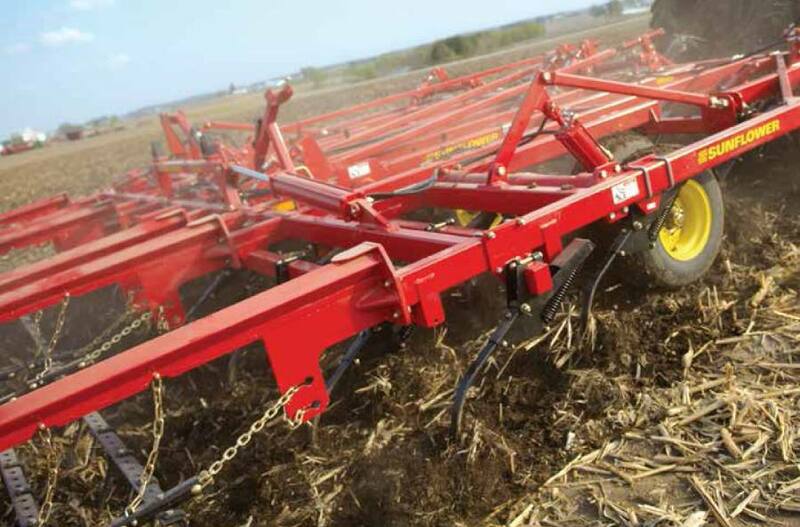 It works at faster speeds than a shank tillage tool and preforms in difficult field conditions. Spacing is the Key: Each component of the tool, Disc Blades, Wavy Coulters and Rotary Spider Tines are set on 7.5” spacing. Each component the interspaces the preceding component. The result is an incursion of steel across the entire width of the tool leaving no soil unconditioned or any weed untouched. Center Frame Lift Assembly: The large diameter 5 1/2” x 5/8” (13.97 x 1.59 cm) lift assembly is well supported by four pivot locations. Lifting cylinders are plumbed in a master/slave circuit and are positioned at each wheel location to maximize lift. Every model features service-free UHMW lift pivot bushings. The lift system never requires lubrication, resulting in more time in the field and less time servicing. Walking tandem axles maintain frame stability and provide uniform component soil penetration across the width of the machine and are standard on all models. Wheels and Tires: SF6683-21 & 25: Eight 12.5L x 15, GY-FI-F, (317.5 x 381) tires with 15 x 10 8 bolt (381 x 254 mm) wheels and 2.25 (57.15 mm) spindles; SF6830-29 - 36: Center: Four, 380/55R x 16.5, (380 x 419) tires with 16.5 x 12, 8-bolt (499.1 x 304.8) wheels and 2.75 x 15 5/16, (69.85 x 387.4) spindles; Wings: Four, 12.5L x 15, GY-FI-F, (317.5 x 381 mm) tires with 15 x 10 inch 8 bolt (381 x 254 mm) wheels and 2.25 (57.15 mm) spindles. Additional Finishing Attachments: Some soils may require additional conditioning; secondary finishing attachments are available.